St Jean de Luz, Aquitaine, France. There are many reasons why this splendid castle is a designated historic monument. Whilst greatly extended during the sixteenth and eighteenth centuries, its origins date back to 1341 – and it has been in the same family ever since. 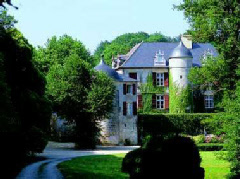 It is said that Louis XI stayed here in 1463, while French general Jean-de-Dieu Soult and the Duke of Wellington were supposedly both stationed in the house during the Napoleonic Wars – though not simultaneously, of course. All rooms (both prestige and charm) are within the main house, and original artworks from the XVII and XVIII centuries feature heavily throughout. Without doubt, this provides a first-rate hotel option for the history traveller journeying between south west France and northern Spain – the border is only a few miles away.